Temple fillers are the classic treatment for volume loss in the upper face. As we age, our temples lose volume, creating a very hollow look. It is easy to replace the volume loss in the temples with dermal filler or with biostimulator. The reduction in volume of the temples causes that loss of roundness which typically starts in the mid 20s and becomes really obvious in the 40s. Those patients who keep themselves very lean are also the hardest hit in the temples. Runners and other heavy exercisers in particular can look much more gaunt in that area as they age. The dose required for dermal filler of the temples is variable. Some patients will be satisfied with 1ml between the 2 sides and, others will need 4 mls or more to get the results that they want. If dermal filler is used, typically a minimum of 1ml will be injected per treatment. Several mls may be required. Treatment could be performed every 4 weeks until the patient is satisfied with the amount of fill in the temple. Ice will be applied to the area briefly before treatment. The doctor will inject using a fine needle. Then pressure with gauze will be applied. If a cannula is used, a small injection of local anaesthetic is injected into the skin and then a needle makes a hole in the skin where the cannula is inserted. 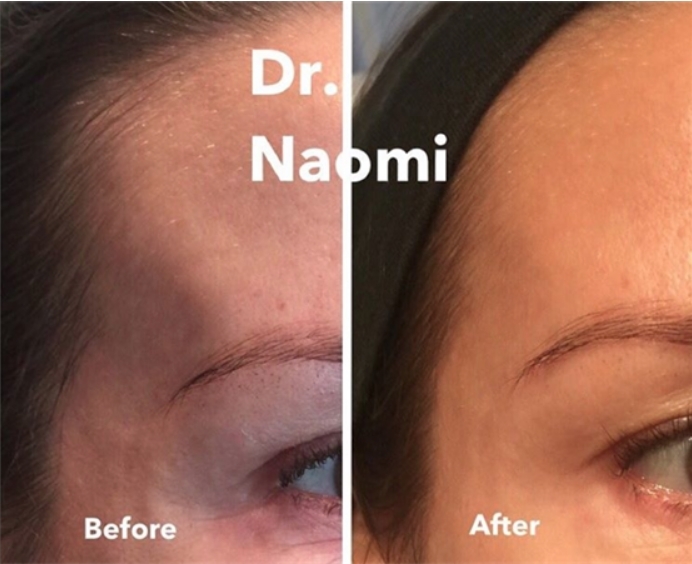 How will I look after dermal filler in the temples? There may be redness and swelling and bruising. Headaches are common after temple biostimulator. Panadol should be taken to treat these. Need for further treatment: With temples, it will often take several syringes/vials of product to get to where the patient wants to be. What to expect after a temple filler /biostimulator treatment? The effect of the dermal filler/biostimulator will be obvious immediately. The biostimulator effect will reduce over the first few days and then gradually increase over the next 2 months. What if I get asymmetry at some time before the 4-8 week point? Temple fillers before and after.